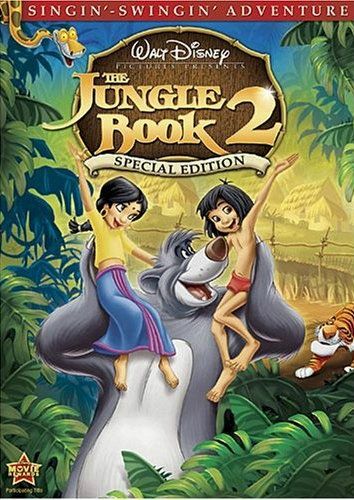 The Jungle Book 2 takes up its story only days after the end of the first Jungle Book feature, and has young Mowgli already integrated into the little community of villagers to which he stumbled into while following the most beautiful thing he had ever seen, a young girl named Shanti. Only thing is, Mowgli seems to be having a little trouble leaving behind the freedom of the jungle and adjusting to a village life fill with chores and rules. After a quick song and dance routine, Mowgli finds himself in trouble with his adoptive parents for attempting to lead all the village children into the dangerous forest. This causes Mowgli to become a bit perturbed, and seeing as how he also misses his friends Baloo Bear and Panther Bagheera, the decision to leave the village and head back to the jungle comes easy when Baloo shows up to pay poor Mowgli a visit. But Shanti sees Baloo and Mowgli together, and getting the wrong idea that Baloo is attacking her boyfriend, she calls the town to alarm... problem is, Mowgli's arch nemesis, that evil menacing tiger Shere Khan, is also in the village looking for the boy, and the villagers mistake Shante's warning calls about Baloo for warning calls about the tiger, giving Baloo and Mowgli a chance to slip out. Shanti witnesses this, and putting aside her fear of the jungle, she follows in pursuit. And from here we start to see pretty much the exact same story as was in the first movie. Mowgli doesn't want to go to the village and leave his jungle friends behind, while Shere Khan is determined to catch and kill the young boy. True, this time another human is thrown into the mix, but really Shanti doesn't add much of anything to the story. She does eventually find Mowgli, but then when she tries to "rescue" him she finally learns that the two are friends and that he doesn't want to go back. So she leaves. This provides the character of Mowgli to have a dilemma - whether to stay in the jungle or return to the village because of his fondness for the pretty girl. What I want to know is where are the new animal characters? Show some creativity, people! The first film introduced us to a bunch of interesting animals, like Panther Bagheera, Baloo the bear, Colonel Hathi the elephant, King Louie the orangutan, that little child elephant... these were all unique and brought the jungle world to life. This film brings a few of them back, but with less personality and importance to the story, and only introduces one new character, a vulture that shows up occasionally for comic relief. Even the bad guy is the same as the last movie. Way to rehash, fellas. Both my wife and I thought the songs were kind of dull, and were annoyed at how often they played the Bare Necessities. Yes, it's a great classic song from the original movie, but it again feels like rehashing, and makes all the other songs pale in comparison. They are both lyrically and musically uninteresting and forgettable. And actually, the new song they sing with the monkeys we actually didn't like very much at all. We were asking each other how that song made it into the final cut of the film. So sorry folks, but this straight-to-DVD sequel is just a mediocre romp.